This year’s guests are The Tinos Byzantine Chorus of the Holy Metropolis of Syros with religious pieces of the Constantinople tradition, Avgerini Gatsi, Yiannis Niarchos and Akis Pitsanis with songs from Smyrna, the vocal quartet “Giasemi” with song of the Greek and Mediterranean tradition, Savina Giannatou and pianist Spyros Manesis in improvisations based on traditional melodies from all around the world, the vocal ensemble Eva quartet with polyphonic songs from Bulgaria, Eliza Carthy with characteristic English folk pieces, and also the vocal orchestra The Happy Hour Choir, a result of the vocal workshop of the Onassis Cultural Center. 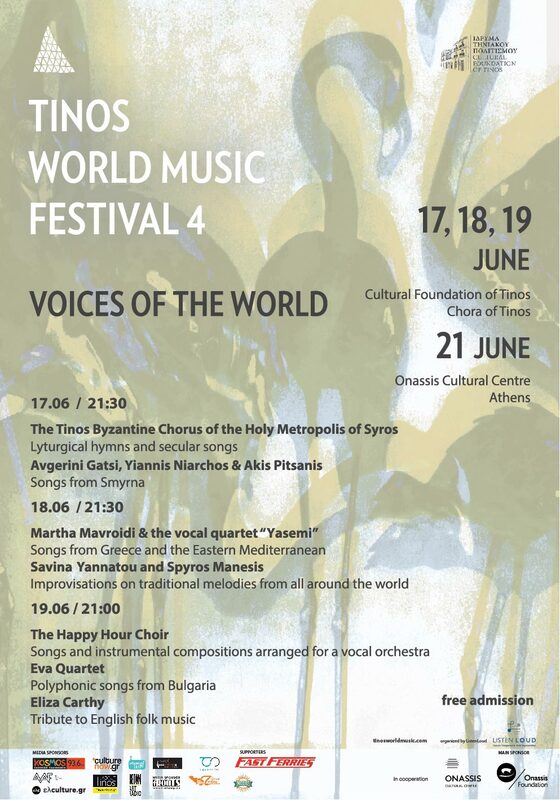 Coming from different origins and traditions, sharing, nevertheless, the transcendental power of the voice, all these artists are joining forces on the stage of the Cultural Foundation of Tinos, bringing forward a wide range of musical repertoire, as well as the never-ending potential of human voice as a musical instrument. And for those of you that were not able to travel to Tinos, the vocal ensemble “Giasemi”, Eva quartet and Eliza Carthy gave a good taste of the festival in a concert at the Roof Terrace of the Onassis Cultural Centre on Tuesday, June 21.